For a reliable, easy-to-use, and customer-friendly online lottery agent, look no further than Lotto Agent. Established in 2012, this company is relatively young, but it's quickly made a name for itself thanks to its responsive and knowledgeable support staff. You'll never get lost or confused thanks to their guidance, and once you dive in, you'll find a lot to like. The user interface is easy to navigate, and financial transactions are a breeze. Claiming your winnings is equally effortless, and thankfully, Lotto Agent doesn't charge commissions. There are no options for syndicates, but overall, with Lotto Agent, you're in good hands. Multiple Deposit and Withdrawal Options: Lotto Agent supports major credit cards, lots of online payment systems, and even direct bank transfers. Videos of Lotto Draws: Aside from instant result updates, you can monitor draws yourself thanks to Lotto Agent's livestreams. Automatic Email Notifications: Lotto Agent has a handy system that sends you purchase confirmations, draw and result updates, and alerts for any wins. Great Customer Support: Lotto Agent responds quickly and exerts its best efforts to resolve your issues. No Syndicates: Unfortunately, Lotto Agent doesn't support buying tickets through syndicates. No Mobile Options: Lotto Agent doesn't have any mobile apps. Lotto Agent is a relatively new online lottery service, having just been founded in 2012. That said, they’ve quickly made a name for themselves as a reliable and customer-friendly lottery agent. 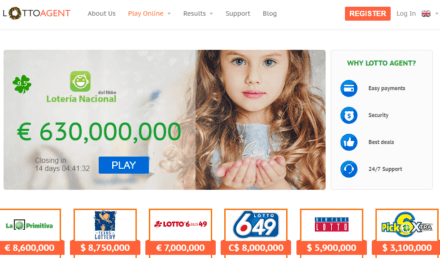 Lotto Agent allows you to play in up to 19 lotteries, from Europe’s Loteria Nacional and EuroMillions to the US and Australia’s Powerball games and even Brazil’s Mega Sena. A wealth of deposit and withdrawal methods are also supported for easy gaming. As its name suggests, Lotto Agent is an online lottery agent: when you play in any lottery, the company’s agents actually purchase a ticket with your chosen numbers. You get a scanned copy of this ticket; in fact, Lotto Agent automatically keeps an archive of your tickets in your account. This makes Lotto Agent a relatively secure and trustworthy system. Couple that with a GeoTrust security certificate and a 256-bit SSL encryption, and you can be sure of airtight transactions. Lotto Agent’s website and user dashboard are easy to navigate. There’s support for multiple languages, too. Only 6 are currently supported though: English, Spanish, French, Russian, Portuguese, and Dutch. Beyond that, you’ve got a global navigation bar on the top of every page that holds dropdown menus that bring you to lottery games and results. Placing a bet is effortless. Lotto Agent compiles all upcoming draws in a handy “Play Online” page, complete with countdowns for each. You select your preferred lottery, choose the number of lines or tickets you want to buy, and input your numbers. If you can’t decide, Lotto Agent also has an easy-pick option that fills in random numbers for you. You can also choose whether to participate in a single draw or multiple draws. Going for multiple draws entitles you to discounts — which get deeper the more draws you choose. You can also subscribe if you don’t want to miss a single draw. Take note that subscriptions give every 10th ticket for free. Once you confirm your tickets, you’ll be taken to a payment page that can take credit cards or deduct from the deposits you’ve already made to your account. The results page, meanwhile, shows you the results from the latest draw. There’s also a livestream feed so you can watch any draws live – a feature that’s unique to Lotto Agent. In addition, there’s an archive of past results, complete with videos of those draws, too. Your account dashboard also has quick links to top up your account credits, manage and withdraw your funds, or view your history of ticket purchases and draw results. Speaking of results, Lotto Agent has a handy notification system for every game. You’ll get an email confirmation of each purchase/transaction you make, so you can keep a personal record in addition to the archive in your account. After every draw, Lotto Agent also sends you an update. If you score a win, you’ll get a notification detailing how much you won and informing you once your winnings have been credited to your account. Speaking of credits, Lotto Agent supports lots of deposit and withdrawal methods. For deposits, you can use: Visa, MasterCard, American Express, Diners Club International, UCB, Skrill, Sofort, Trustly, Poli, GiroPay, PaySafe, EntroPay, iDeal, Nordea, e-Payment Standard (EPS), NETS, Neteller, CartaSi, PostePay, DK, ePay.bg, Przelewy24, and direct bank transfers. For withdrawals, Lotto Agent supports: Visa, MasterCard, Skrill, WebMoney, and direct bank transfers. Lotto Agent doesn’t charge commission on any of your winnings, but most payment processing systems do charge a handling fee. For winnings over $100,000, you’ll have to contact Lotto Agent to discuss a withdrawal procedure. If you hit the jackpot, you’ll probably have to claim it in person; in that case, Lotto Agent helps you plan how to collect your winnings and advises you on the relevant tax and legal details. Lotto Agent has an ongoing Buy-1-Get-1-Free promo for ticket purchases made by new users. The company also has an Invite-A-Friend program that gets you an extra $5 in account credits once your invitees buy their first lotto ticket. The company also has an official affiliate program that works via a multi-level commission system. Lotto Agent delivers great customer support, with quick responses from knowledgeable support staff who often go above and beyond to resolve any issues you might have. They are available 24/7 through live chat, phone, and email. Lotto Agent also has easy-to-navigate sections for Frequently Asked Questions and how-to guides, so you’ll always have a knowledgebase to consult regarding normal procedures and common questions. What's the Verdict on Lotto Agent? Lotto Agent is a relatively new company, but they’ve quickly built a reputation for reliability and stellar customer support. The intuitive interface makes playing any of the 19 available lotteries a breeze, and your account dashboard gives you a comprehensive record of your ticket purchases and financial transactions. From scanned copies of tickets to 256-bit data encryption, Lotto Agent also ensures the security of your account. The lack of syndicates and mobile options is disappointing, but there are lots of perks here to balance those out. Try your luck with Lotto Agent today! Please do not waste your money. In my personal experience i tell you. This guys took your money from your bank account without any notification also selling fake lottery online.